Alb+Ino: An albino is a person or animal with abnormally white skin and hair, resulting from a lack of pigment, hence albinism for the condition. He is suffering from albinism since birth. 1. Albedo: The extent to which a celestial body reflects light; how bright it is. 2. Albumen: Egg white, or the protein contained in it. 3. Albinotic: Afflicted with albinism or partial albinism. 5. Albeduria: The passing of pale or white urine of low specific gravity, as in chyluria. Also albinuria. 7. Albescent: Growing or becoming white; shading or passing into white. 8. Albicans (s), Albicantia (pl): White. 9. Albiculi: White people; used as a derogatory term. 11. Albiflorous: Having white flowers. 12. Albify: To make white, to whiten. 14. Alb: A tunic or vestment of white cloth reaching to the feet, and enveloping the entire person; a variety of the surplice, but with close sleeves; worn by clerics in religious ceremonies, and by some consecrated kings. Albatross: From the Spanish alcatras for the frigate bird, changed and applied to the albatross under the influence of albus, the bird being white. Albion: Ancient name for the British Isles, in reference to the white cliffs of Dover. 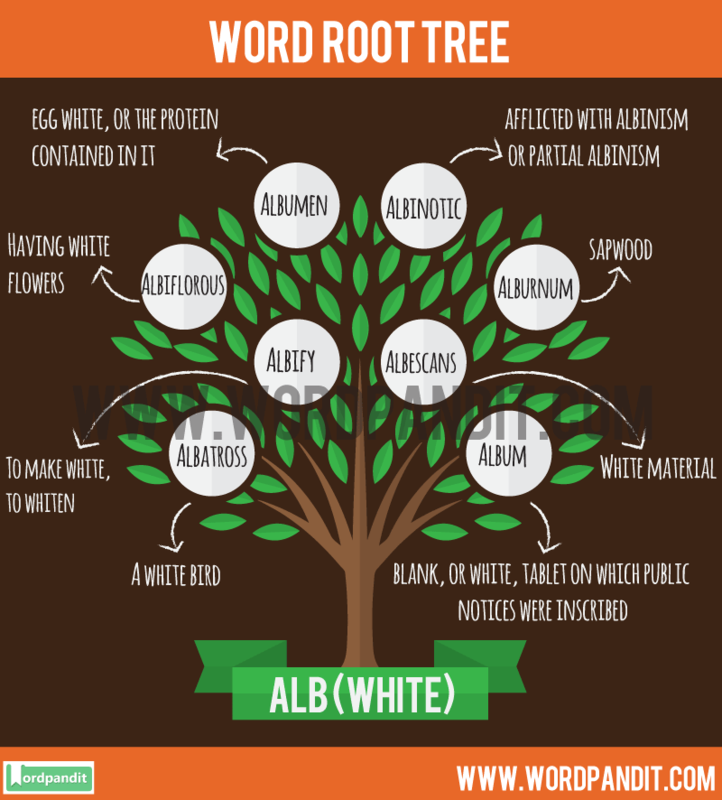 We hope this article on the commonly used Alb Root Word and it has been helpful to you in remembering the words based on the Root Word Alb and enhance your vocabulary.